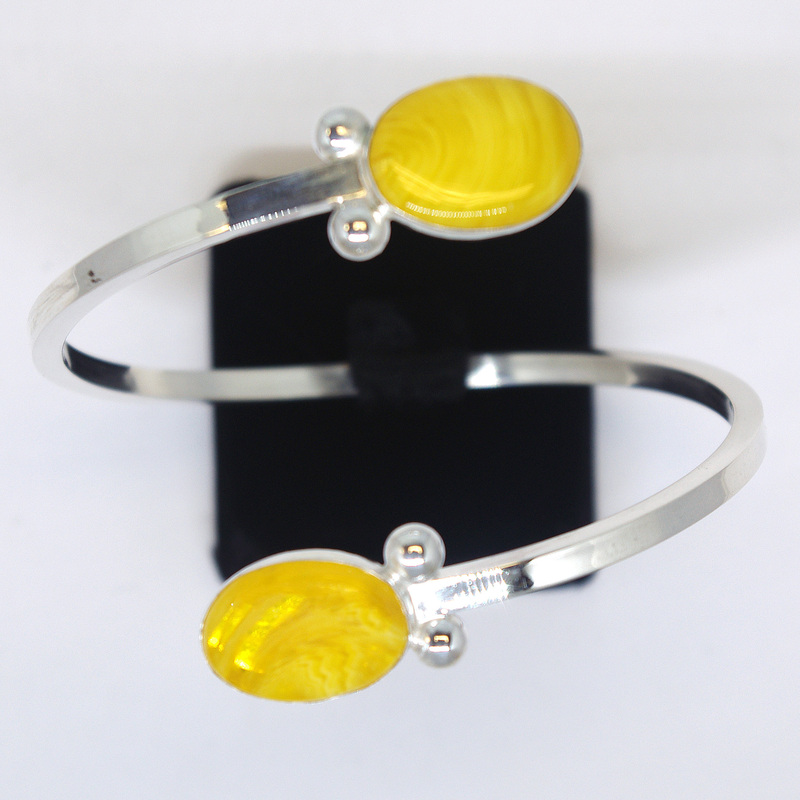 Modern Classic Jewelry - This is a fun and light slip on bangle bracelet created from square sterling silver tubing with an oval yellow Copal Amber cabochon (18mm x 13mm) on each end. This is a simply elegant sterling silver bracelet featuring, at each end, two oval Copal Amber cabochons.The bracelet is created from square silver tubing and accented with silver balls on either side of the fully bezeled stones. Each Copal Amber cabochon is unique and will be approximately the same size as this picture. Copal Amber is from Tanzania and is a younger Amber than the Baltic Amber. The bracelet slips on through the opening and can be adjusted to fit the wearer. The bracelet should not be bent repeatedly, so removing it should be done by turning the bracelet to fit the side of the wrist and sliding it off. This bracelet style can be customized for your individual style. This bracelet is handmade in our studio and may vary slightly, but our attention to detail ensures that you are wearing a one of a kind high quality bracelet. This is a truly unique piece that is designed, created, and signed by Aaron Rubinstein and Modern Art Jewelry. The bracelet approximately is .12" wide. The Copal Amber is approximately .72" long x .53" wide (18mm x 13mm). Copal Amber calms the nerves by releasing anxiety and tension, irritation, & feelings of being overwhelmed. Alleviates depression, & increases clarity of mind. This is a very good stone for someone who is grieving or depressed but needs to make important decisions. This is a slip-on bracelet without a clasp. We accept custom orders for additional sizes and widths. Each purchase is shipped in a beautiful presentation box to impress your loved one. We also gift wrap, if you would like, and provide a handwritten card.